I've been trying to get into the habit of using face masks on a regular basis, rather than simply adding them into my regime as & when I feel that my skin needs something extra and I recently included Avene Soothing Moisture Mask within my Sunday evening pampering routine. Avene describe Soothing Moisture Mask as being designed for dehydrated and weakened sensitive skin which has become reactive, showing signs of redness, tightness & stinging. They state that the pampering mask is very rich in Avene thermal spring water to soothe, nourish and moisturise, thereby promoting skin hydration to leave skin soft, supple & radiant. 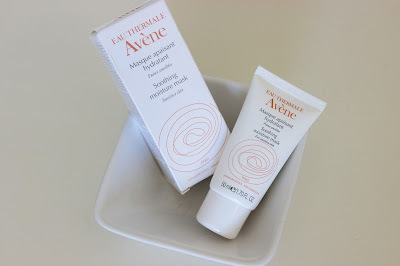 The simple white packaging is in keeping with the Avene branding. The functional matte tube is presented in an outer box. I didn't mind that the mask is presented in a relatively small 50ml size. It means that it's travel friendly and seeing as it's rare that I finish up an entire tube of mask before the "use by" day, I'd probably be more likely to finish the smaller size. On this note, I liked that the packaging features a "use by" date and what's more, found that the directions were clear & easy to follow. The mask itself is a white, lightweight, milky lotion which I found easy to smooth onto skin. The texture was lighter than I was expecting. As the name suggests, Avene Soothing Moisture Mask felt soothing on the skin both during the initial application and during use. It has a pleasant, fresh scent which was reminiscent of lotion. The mask needs to be left on skin for 10-15 minutes which seems to be the standard suggested time for most moisture masks. After 15 minutes, the mask had absorbed into my driest areas. It was easy to remove the remaining residue with a tissue. Following use, my skin was left feeling nourished and looking plumped & moisturised. It's worth noting that Avene Soothing Moisture Mask contains mineral oil so it won't be for those who prefer to avoid this ingredient. I feel that the mask would be a good choice for those with dry skin but the formula may be a little rich (despite the lightweight texture) for those with acne prone skin. Avenue Soothing Moisture Mask costs £11.50 for 50ml. I've heard good things about this avene maske product. Going on my wish list now!